Iranian forces infringed upon 10 U.S. sailors’ right of innocent passage under international law by arresting them at gunpoint, a Navy investigation into the Jan. 12 incident found. The investigation concluded that it was "reasonable" for Iran’s Islamic Revolutionary Guards Corp Navy to investigate the appearance of the 10 American personnel and their two riverine command boats in their territorial waters but that Iran’s obstruction of the vessels’ transit "infringed upon their right of innocent passage under international law and was disproportionate under the circumstances," according to declassified documents released Thursday. "Iran’s boarding and seizure of the [riverine command boats] followed by the interrogation and video recording of the crew clearly violated established norms of sovereign immunity. The [riverine command boat] crews, although not operating in accordance with established U.S. Navy procedures, did act consistently with international law," the executive summary of the findings state. The investigation team also found fault with members of the American crews for deviating from their planned course from Kuwait to Bahrain through the Persian Gulf without authorization. The captains and crews of the riverine command boats were "derelict in performing their duties to expected norms and standards," the findings indicate. "They did not review the [plan of intended movement]; they deviated from the [plan of intended movement] without authority," investigators found. "They failed to report the engine casualty to the Tactical Operations Center (TOC); they failed to report the sighting of unpredicted land; and they failed to maintain maneuver while repairing one of the RCB engines." 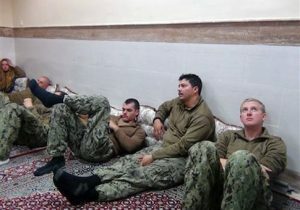 The investigation was initiated shortly after the American sailors were detained overnight by Iranian personnel on Farsi Island, an incident that occur days before the official implementation of the Iran nuclear deal. Iran has taken advantage of the incident to embarrass the United States, while the Obama administration has tried to position the incident as a diplomatic success. On the day of the sailors’ release, Secretary of State John Kerry thanked Iran for its cooperation, calling it a "testament to the critical role that diplomacy plays in keeping our country safe, secure, and strong." The White House has also said that images of the sailors being arrested at gunpoint, which were disseminated by Iranian state media, were not embarrassing. The Navy Command investigation was completed at the end of February, after which the vice chief of naval operations directed a more comprehensive review of the incident. The Navy’s judge advocate general was asked to analyze U.S. and Iranian compliance with international law. The two boats deviated from their planned route "from the moment they left port," the timeline of the incident provided by investigators indicates, which "caused them to transit unknowingly through Saudi Arabian territorial seas and then through Iranian territorial seas." One of the boats suffered engine problems, which led the crews to stop and troubleshoot, after which they were approached by Iranian patrol craft "with weapons uncovered." "As the crews briefly attempted to evade and then communicate with the Iranians, two more IRGCN vessels arrived. The RCBs, being overmatched, were then forced to reposition to Farsi Island where the crews were held overnight and interrogated," the investigation documents state. The actions by the Iranian personnel breached international law and the principle of sovereign immunity, investigators concluded. The findings note that the U.S. boats were allowed to transit through Iranian territorial waters "continuously and expeditiously as an exercise of the right of innocent passage," which is outlined in the U.N. Convention on the Law of the Sea, by which the U.S. abides. "Vessels in innocent passage may stop if necessary due to force majeure or distress; the [riverine command boats] did not violate international law by stopping to assess and repair an engine casualty. The [Iranian navy] vessels obstructed innocent passage by maneuvering in front of one of the [riverine command boats] with weapons trained on the crew, forcing it to stop," the findings state. Investigators also concluded that Iran "disregarded" the well-established norm of sovereign immunity "when its agents boarded, searched, and seized the [riverine command boats], and replaced the colors of the United States with the [Iranian Revolutionary Guard Corps Navy’s] standard." "Sovereign immunity also protects personnel onboard a State vessel from search and seizure by foreign authorities to include preserving the sanctity of their identities. Iran therefore further violate the sovereign immunity by its detention, search and video recording the crew," the findings state. Iran state media released images of the sailors being arrested at gunpoint with their hands upon their heads and others of the American personnel in custody shortly following their release. Iran state television also broadcast a video of one of the sailors apologizing for the incident. Chief of Naval Operations Adm. John Richardson, along with other Navy leaders, briefed the media on the findings of the investigation Thursday morning. The Navy will take corrective actions to address the failings of American personnel documented in the report to ensure that such incidents will not happen again, service leaders said Thursday at the press conference. They told reporters that three American personnel have already been relieved of their duties, while six additional individuals are also liable to receive disciplinary action. Before the release of the investigation’s findings, the Navy had already relieved two commanders of their duties because of their actions: Capt. Kyle Moses, commander of U.S. Naval Forces Central Command (NAVCENT) Task Force 56, and Cmdr. Eric Rasch, the commanding officer of Coaster Riverine Squadron 3. "This incident was the result of failed leadership at multiple levels, from the tactical to the operational," the Navy investigation concluded. Investigators faulted two commanders in particular, whose names are redacted by who are identified as Commander of Task Force 56 and Commander of Task Group 56.7, for "inappropriately [tasking] their subordinates beyond the capabilities and limitations of their training and craft." "They did not ensure adequate planning and preparation, and failed to conduct adequate risk management," the findings state. UPDATE 12:00 P.M.: This post has been updated with additional details from the U.S. Navy's investigation.